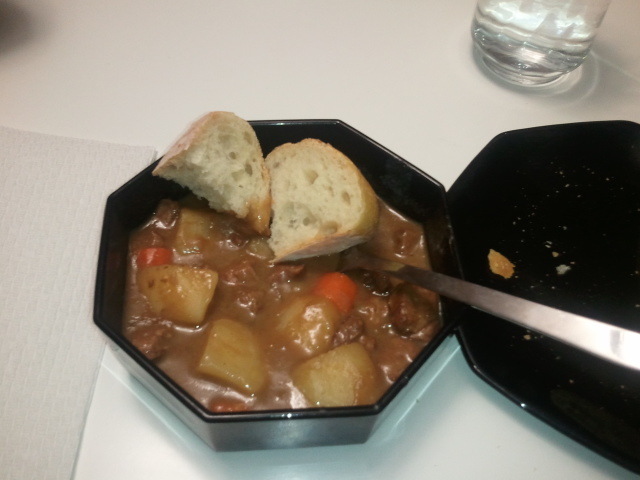 This week’s meal was beef stew: the perfect winter meal. 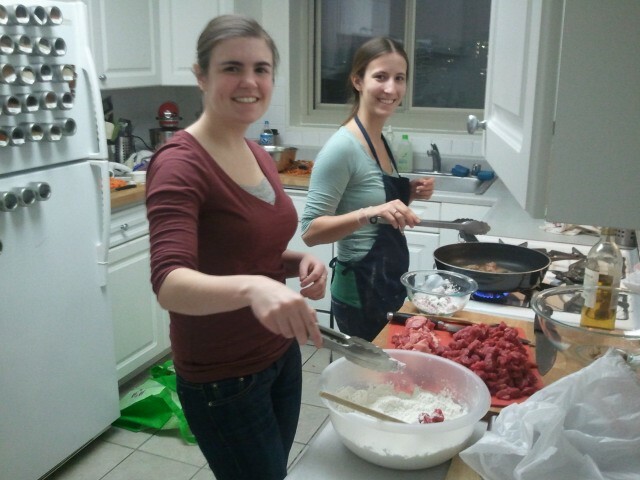 It went really well, except for one horrendous mistake: we didn’t start cooking until 3:30 pm. This would be an appropriate time of day to start cooking any other meal, but beef stew takes about a hundred million years to cook. We used a recipe from The Loud and the Clear, which was easy enough for us to handle and tasted delicious (when we finally got to eat it). 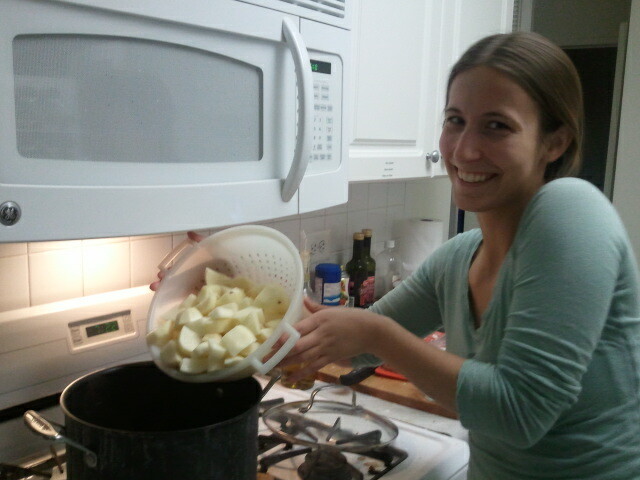 We doubled the recipe, so we ended up with enough stew to feed a small army for several months. 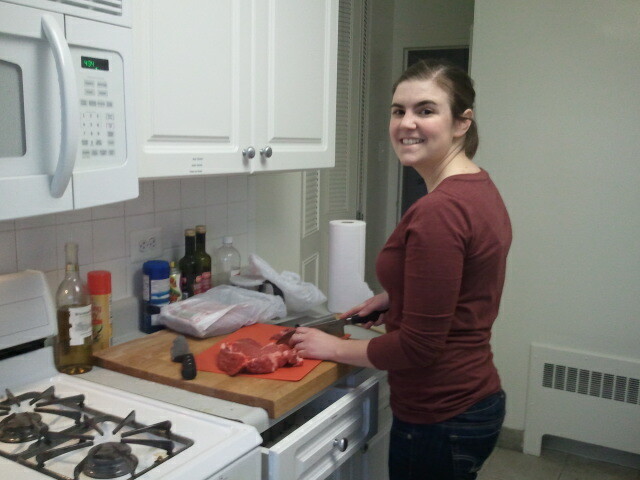 The first step was to prepare the four pounds of meat. Jill fired me from this part because I didn’t know what I was doing. Apparently, you aren’t supposed to use a dull, serrated knife! The grocery store was out of stew meat, so we bought the second cheapest beef available–not sure what it is called, but I if I can convince Jill to dig through the trash later, I will update with specifics. While she hacked away at the meat, I peeled and chopped exactly 10 potatoes (yes–this was on purpose) into bite sized pieces. I repeated the process with eight carrots. 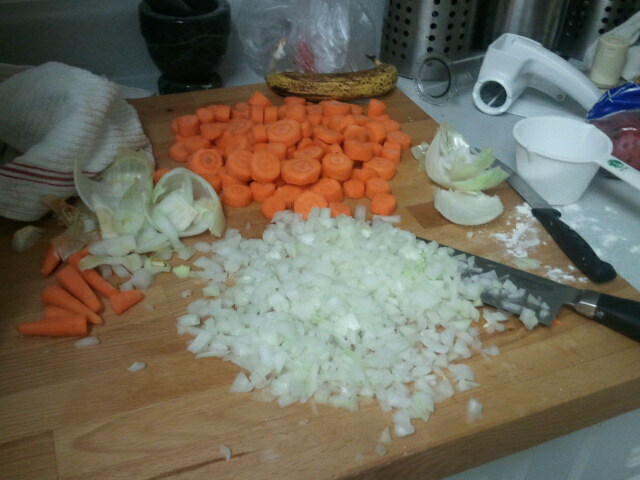 Second thing I learned tonight: you are supposed to peel carrots! I have spent my whole sheltered life eating pre-peeled baby carrots (don’t judge me!). Finally, I diced up one large onion (half of what the recipe called for) so that the pieces were small enough to disintegrate into the stew (we don’t really like onions; just the flavor they leave behind). Once the prep work was done, we coated the meat in flour (seasoned with some pepper) and browned it in a pan with some olive oil. Then, we added the meat and two boxes of beef broth to a large pot and let it simmer for one hour. At the end of the hour, we added in the potatoes, carrots, and onions and let it simmer for two more hours. For the second hour, we left the cover off of the pot so that the stew thickened. 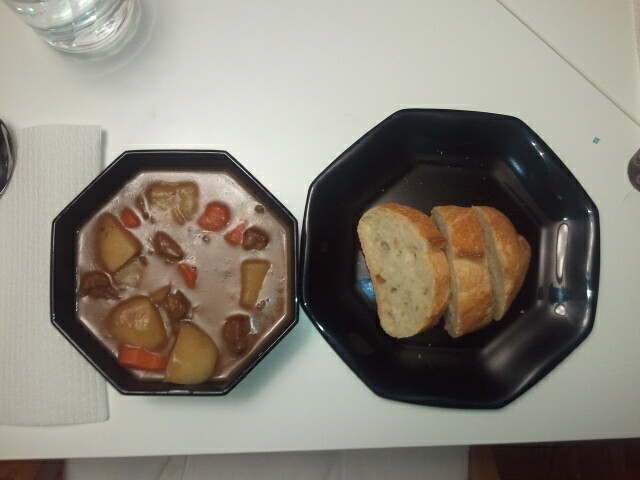 The stew turned out to be amazingly delicious. This is going to make some seriously fantastic leftovers! I’m sure your dad would have enjoyed this meal. He loves Beef Stew. I on the other hand would rather make a sandwich! Really? I guess that’s why we didn’t eat it a lot growing up. I love it! So does Milo… he kept trying to lick my hands and face after I finished eating tonight because they smelt like stew. It sure looks good girls, good food is always worth the wait. I’m so glad you guys liked the recipe! Hooray! It was delicious, thanks for posting it!